February 8, 2016 is Chinese New Year, beginning of the Year of the Fire Monkey. Have you wondered why the Chinese New Year starts in February and what a Fire Monkey is? These two posts of mine, on Linked In, address that. The earth goes around the sun and the moon around the earth in cycles that don’t come out in whole days. All people who have made calendars have had to wrestle with that. The Asian and European solutions to this problem are different and make a fascinating comparison that the different dates of the start of the New Year highlights. 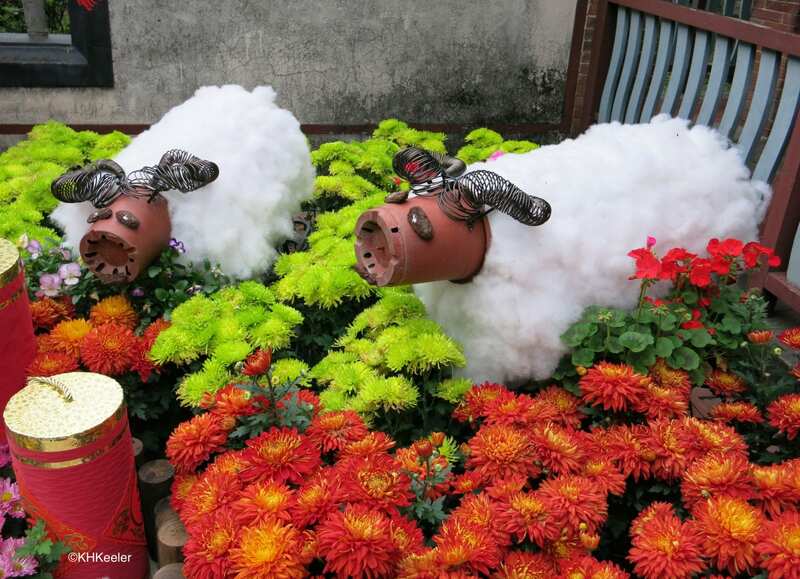 Here are sheep in a Year of the Sheep display in Taiwan from 2015. The heads are flower pots, the horns wire springs, the backs cotton. The animal names for the years give great opportunity for creative New Year’s displays. Compare decorating for the upcoming Year of the Fire Monkey compared to decorating for the year Two Thousand Sixteen!